The Almerian Coastline begins in Adra and heads up to San Juan de Terreros. Located between Granada and Murcia provinces, this is a region with plenty of sunshine all year round. With a 170 kilometre stretch of coastline there are lots of towns and beaches to discover when you holiday in Almeria. 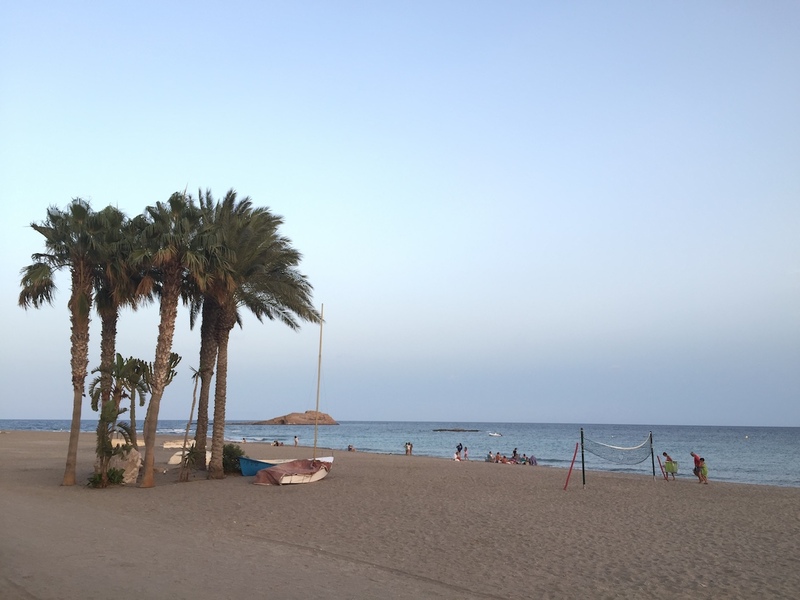 Choose between large resorts such as Roquetas de Mar or protected natural spaces like Cabo de Gata, other points of interest are always an easy drive away. Almeria isn’t just a beach lover’s destination. This corner of Spain has been the location for many film and TV shows. The unique desert landscape and whitewashed villages are worth exploring not only filming. The only desert in Europe. Tabernas, makes a great backdrop this together with the beautiful beaches and the grand Alcazaba fortress in Almeria itself. All have provided great movie locations over the years. This Andalusian wild west has its own theme park open to visitors. To the east of the city Fort Bravo is actually used for filming now but has a great day out for families. If you want a less showy Wild West experience, pop over to the small village of Los Albaricoques. This place was used in several western films in the 1960´s. The Alba restaurant at in Los Albaricoques has a good value daily menu. Inside the bar the walls are covered with photos and some of the props used in those western films. See tropical fish and manta rays at Aquarium de Roquetas de Mar. They even have a clownfish, which will thrill Disney fans who have seen Nemo. You may even get to see the sharks being fed. Younger visitors will enjoy touching starfish and hermit crabs. An interesting activity for all ages. Close to Vera, the Desert Springs Golf course is a great location for families. With cricket and golf facilities, this is also a large outdoor swimming pool with a bar too. This quality golf resort allows you to mix golf with a family holiday in the small town of Cueva de Almanzora. After appearing in Game of Thrones the Alcazada de Almeria is a must see location. Perched above the port and city. Enjoy the panoramic views and great photos at this historic site. El Cables Ingles is an interesting industrial structure close to the Paseo de Almeria. 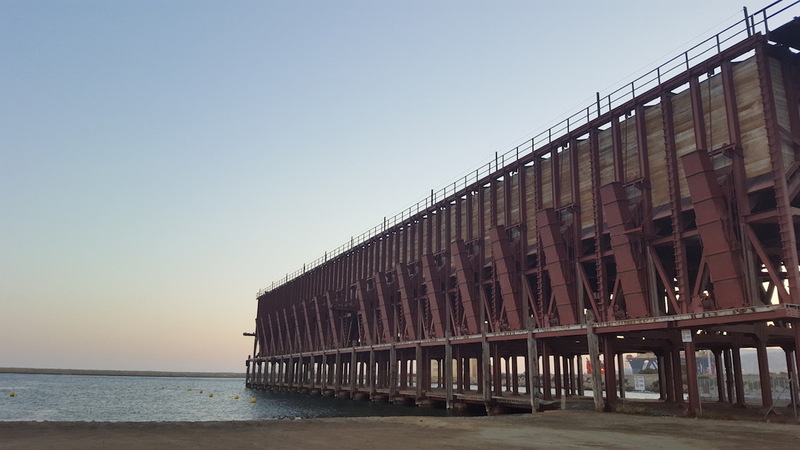 Once a loading platform to shift minerals from trains and load up cargo ships. This was built by Gustave Eiffel. Lit up at night we remember the mining past of the region. A quaint white town sitting above the coast, slightly inland. Enjoy the panoramic viewpoints from a street café in Mojacar. Some of the surrounding countryside and beaches from there are quite impressive. A sleepy Andalusian town with cobbled streets and have Arab style gates. Head to Plaza Parterre to have a drink amongst the colourful plants and shrubs. Driving around Cabo de Gata Natural Park feels like you are travelling back in time. Spot along the way old stone Windmills, arched shaped water deposits and wooden waterwheels. Enjoy fresh fish in the villages of Isleta del Moro and Las Negras. Take photos for the family album at Mirador de la Amatista or at the Faro de Cabo de Gata lighthouse. Smaller fortresses and lookout towers are dotted along the coast too, a legacy from other times when pirate attacks were frequent. Hop aboard the Ola 21 Catamaran at Carboneras Port. With two different routes see Cala del Plomo or Cala San Pedro. Choose a 2 or 3 hour ride depending on that days outing. With such clear water kayaking around Cabo de Gata is good fun. With different stops on the route a small coves and beaches. Some tours even include a break to swim and snorkel. In Almeria the wide choice of beaches allows you to switch up your beach days over the holiday. 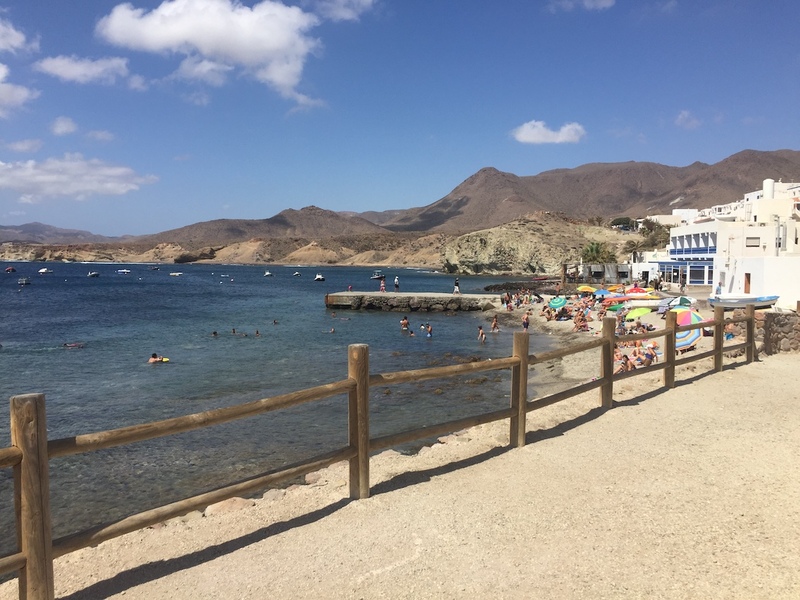 Head to large beaches of Roquetas de Mar with all the facilities or a secluded rocky cove Almeria in the Cabo de Gata Natural park.